Coming Around Again is a peachy strong holographic. Shown is two coats, no top coat. Prime Time is a medium pink strong holographic. shown is two coats, no top coat. A Veiled Promise is a purpleish pink strong holographic. Shown is two coats, no top coat. Fix Up, Look Sharp is a grape purple strong holographic. Shown is two coats, no top coat. Metamorphic is a steely blue strong holographic. Shown is two coats, no top coat. Deafening Silence is a periwinkle blue strong holographic. Shown is two coats, no top coat. Beautiful Distraction is a seafoam strong holographic. Shown is two coats, no top coat. Rise and Fall is an aqua blue strong holographic. Shown is two coats, no top coat. Dark Enlightenment is a deep cool toned purple holographic. Shown is two coats, no top coat. 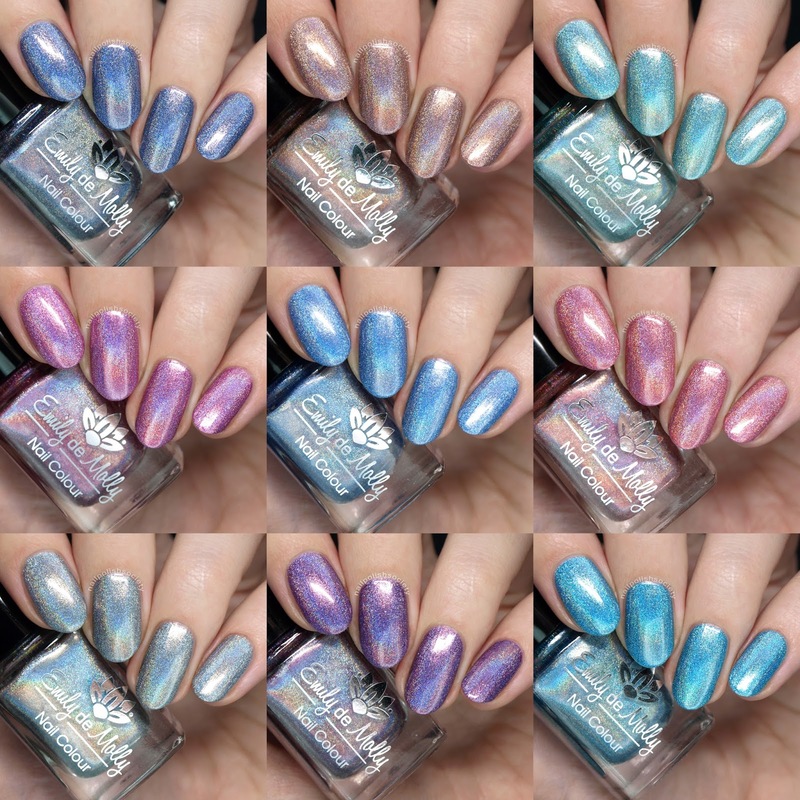 The Super Holo collection is available now through both the Australian site and US and international site. What do you think of this collection? I love the saturation of colors, especially in the dullness of winter here. Coming Around Again and A Veiled Promise are my top picks. What are yours?